JEFFERSON AS A MAN OF SCIENCE. from Preface to The Writings of Thomas Jefferson, Volume 19. The first public demonstration of Jefferson's capability as a man of science was the preparation and [p.iv] publication in 1781 of his “Notes on Virginia.” “This,” according to the late G. Brown Goode, assistant secretary of the Smithsonian Institution and the historian of American science, “was the first comprehensive treatise upon the topography, natural history and natural resources of one of the United States, and was the precursor of the great library of scientific reports which have since been issued by the State and Federal governments. Though hastily prepared to meet a special need, if measured by its influence it is the most important scientific work as yet published in America.” In this work he successfully overthrew many of the arguments of Buffon, who was at the time considered the highest living authority on natural history subjects; and later, when he came to know Buffon in Paris, the latter admitted some of the errors that he had made. In fact palaeontology in the United States had its beginning in a paper filed with the American Philosophical Society by Jefferson under date of March 10, 1797, announcing his discovery of the Megalonyx Jeffersoni; this paper was published under the title, “Memoir on the Discovery of a Quadruped in the Western Parts of Virginia,” in the Transactions of the American Philosophical Society. The original specimen was deposited in the American Philosophical Society and subsequently transferred to the Academy of Natural Sciences of Philadelphia, where it may still be seen. The announcement of this discovery was coincident with his arrival in Philadelphia to be inaugurated as Vice-President of the United States, and upon that occasion he brought with him a collection of fossil bones of the specimen in question, which he had obtained in Greenbrier County, Virginia. But his interest in palaeontology did not stop here. In February, 1801, during the excitement of the contest with Aaron Burr, he was corresponding with Doctor Wistar with regard to some bones of the mammoth which he had just procured from Shawangunk, in New York. In 1808, when the excitement over the embargo was highest and his policy was under the severest denunciation, he was carrying on palaeontological [p.vi] studies in the White House. Under his direction upwards of 300 specimens of fossil bones had been brought from the famous Big Bone Lick, and spread in one of the large unfinished rooms of the Presidential mansion. Doctor Wistar was asked to come from Philadelphia and select such as were needed to complete the collection of the Philosophical Society. The exploration of the Lick was made at the private expense of Jefferson, through the agency of General William Clarke, and this may fairly be recorded as the beginning of American governmental work in palaeontology. But palaeontology was not the only scientific subject which engaged his attention. He was, when Secretary of State in Washington's Cabinet, chairman of a committee organized by the American Philosophical Society in 1792, to collect materials for the natural history of the Hessian Fly, whose ravages in the wheat-fields threatened so great a danger to the prosperity of the country. This appears to be the first organized effort in economic entomology in the United States. His interest in agriculture even went in the direction of the invention of a new plow. As far back as 1788 Jefferson entered upon some speculations concerning the improvement of plows, and attempted to sketch an original and uniform mathematical rule for shaping the mould-board of a plow, the object being to secure the regular inversion of a certain depth of the surface soil with the least application of force. By 1796 his new plows were in use. A Mr. Strickland, a member of the English Board of Agriculture, being on a visit to Monticello, saw there plows in operation constructed on this principle, and mentioning them favorably on his return, the Board, through its president, Sir John Sinclair, requested from Mr. Jefferson a model and a description. These were forwarded to England in 1798. The description was published in the Edinburgh Encyclopaedia and in the fourth volume of the Transactions of the American Philosophical Society. The invention also attracted attention in France. He is likewise [p.viii] credited with being the inventor of the copying press. He made observations in meteorology and had a good collection of philosophical apparatus. This statement is fully borne out by the impetus which Jefferson gave to the relationship of the Government to scientific work. The inception of the system of scientific surveys of the public domain was the outcome of more than twenty years of earnest endeavor on his part. It was he who suggested to John Ledyard, of Connecticut, the enterprise of exploring the western part of our continent by passing through St. Petersburg to Kamchatka, and procuring passage in some Russian vessel to the United States—a project which failed because of the arrest of Ledyard. In 1792 he proposed to the American Philosophical Society to set on foot a subscription to explore the great West, and for this subscription became responsible for raising one thousand guineas. This was to have been undertaken jointly by Captain Meriwether Lewis and Michaux, the botanist, but it also failed. In 1803 he recommended to Congress in a confidential message, the sending of an exploring party to trace the Missouri to its source, to cross the highlands, to follow the best water communication [p.ix] which offered itself from thence to the Pacific Ocean. Congress approved the proposition and voted a sum of money for carrying it into execution. Captain Lewis, who had been with Jefferson nearly two years as private secretary, immediately renewed his request to have direction of the party. The second expedition toward the West was also sent out during Jefferson's administration, being that under command of General Z. M. Pike, who was sent to explore the sources of the Mississippi River and the western parts of Louisiana, continuing as far west as Pike's Peak, the name of which still remains as a memorial of this enterprise. It was during Jefferson's administration, too, that the project of founding the Coast Survey arose. This was recommended to Congress by the President in 1807. It was under his Presidency that the idea of Washington for the establishment of a Military Academy at West Point was fulfilled, and Jefferson also had a plan, realized later, for the establishment of a National Observatory. It was he who proposed the unit of the present coinage of the United States. 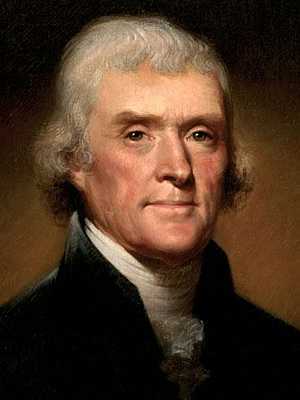 His devotion to science, coincident with his active public life and the bitter enmities which it engendered, gave the opportunity for much public criticism, yet it afforded Jefferson, as it did to Franklin, especial consideration as representative of the new nation in France; it earned him election in numerous learned societies in Europe and gave an impetus to the organization of science both in the learned societies, in the colleges and in connection with the Government of the United States, such as could only have been exercised by a man who had occupied the exalted office of President of the United States.